Rare, often under-recognised and reported late, brain and solid tumours account for nearly 55 percent of childhood cancers, causing significant physical, psychological and social impact to children and their families. "Very young children are often unable to report their symptoms accurately, and in later adolescence may hide or be reluctant to come forward," explains Dr Amos Loh, Chairman, Steering Committee, VIVA-KKH Paediatric Brain and Solid Tumour Programme, who is also Consultant, Department of Paediatric Surgery, KK Women's and Children's Hospital (KKH). "Solid tumours are also more diverse, with far fewer individual tumour numbers as compared to blood cancers. This results in a more challenging accrual process for any clinical protocol and slows the advancement of care for these diseases." 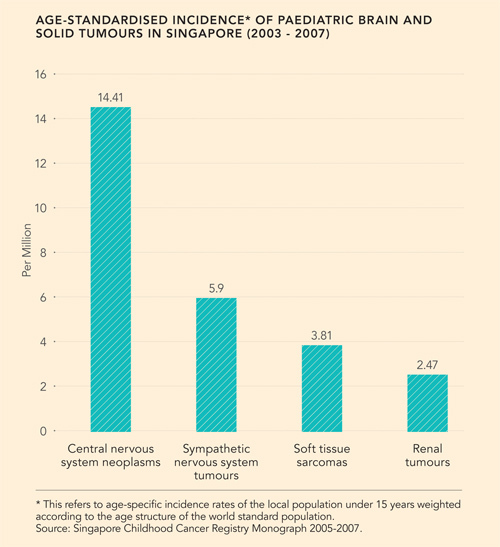 Childhood cancers are the second leading cause of death in children in Singapore and developed countries worldwide. However, despite advances in treatment, outcomes for most childhood solid tumours remain inferior to blood cancers. 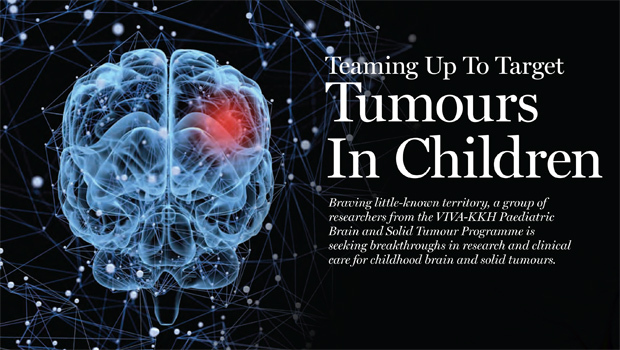 In 2015, the VIVA-KKH Paediatric Brain and Solid Tumour Programme was established to pursue advancements in care for childhood brain and solid tumours through translational clinical research, leveraging on the collective strengths and expertise of partner institutions KKH, Viva Foundation for Children with Cancer (VIVA) and St. Jude Children's Research Hospital (SJCRH), USA. Today, programme collaborators Dr Amos Loh, Dr David Low, Head and Consultant, Neurosurgical Service; Associate Professor Kenneth Chang, Head and Senior Consultant, Department of Pathology and Laboratory Medicine; Dr Soh Shui Yen, Senior Consultant, Haematology/Oncology Service, KKH; and Dr Francis Chin, Senior Consultant, Department of Radiation Oncology, National Cancer Centre Singapore (NCCS), are focusing their attentions on the four most common tumour types in Singapore. “The establishment of our multi-disciplinary team across different specialities and allied health services aims to streamline clinical care, research and education. This translates to improved outcomes for our patients and opportunities for advancement in academic research and education both locally and regionally,” says Dr Low. The team's sights are set on rhabdomyosarcoma (a type of soft tissue sarcoma), neuroblastoma (the most common sympathetic nervous system tumour), kidney tumours (in particular Wilms tumour), and central nervous system neoplasms (in particular medulloblastoma). "This group of cancers is often metastatic, in that they spread beyond the primary tumour to affect other parts of the body. Their incidence in Asian countries also appears to differ from the west," Dr Loh says. "Directed research into the epidemiology, clinical outcomes, tumour biology, and socioeconomic impact of paediatric cancer in Asian children will allow better interpretation of Western data and applicability to local and regional populations. Furthermore, studying the differences in incidence, histology and treatment response observed in Asian children may enable the discovery of genetic reasons for the differences observed in different ethnic groups, and hopefully help us to refine or direct novel therapeutic approaches for Asian children." One of the programme's first steps was to establish a dedicated multidisciplinary brain tumour clinic to help patients and their families negotiate the complexities of their care journey, supported by nurse coordinators to enhance the coordination of care from various disciplines at multiple points during the treatment process. 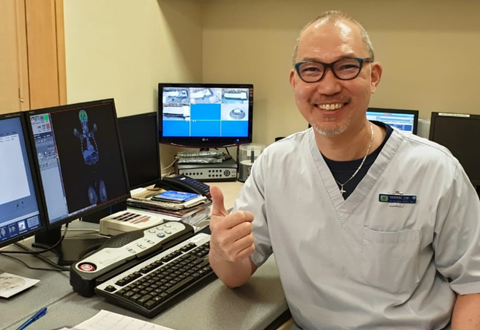 "The continual development and coordination of subspecialty care across multiple disciplines is not only fundamental to providing holistic, comprehensive care to the child and their family, but also absolutely crucial in advancing treatment and outcomes for childhood solid tumours," Dr Soh says. In collaboration with researchers and clinicians at NCCS and the University of Amsterdam, the team is also implementing a cancer predisposition screening project using three dimensional photography and clinical screening methods to detect facial morphometric features in children with a predisposition to developing brain and solid tumours. "Early diagnosis is critical in allowing therapy to be initiated when disease burden is low, and minimising the complications of more aggressive therapy while optimising the potential for cure," Dr Soh explains. "Screening for features of cancer predisposition in children can help to give us a better understanding of their presenting profi le and a greater awareness of the subtleties of their tumour symptoms. 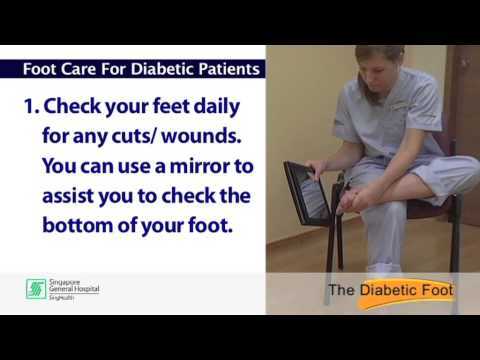 This is a great step towards mitigating diagnostic delay in children." Further along the care development pathway, A/Prof Chang is in pursuit of a new approach to brain tumour characterisation using cutting edge technology. "Medulloblastomas are a form of fast-growing brain tumour. More than 70 percent of all paediatric medulloblastomas are diagnosed in children under age 10," A/Prof Chang says. 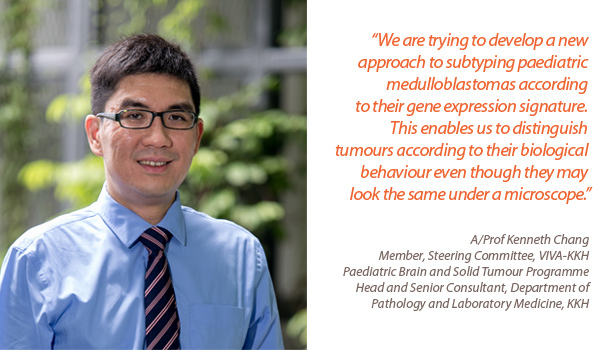 "We are trying to develop a new approach to subtyping paediatric medulloblastomas according to their gene expression signature. This enables us to distinguish tumours according to their biological behavior even though they may look the same under a microscope." Using the first and only clinical diagnostic NanoString nCounter® platform in Singapore, the relative amount of genetic 'signal' that each tumour displays is measured in order to characterise it more specifically according to its gene expression signature and biological behaviour. "We invested in the NanoString nCounter® platform as it has a unique capability to perform tests accurately on material from formalin-fixed paraffin embedded tissues. This is the simplest method of preservation and treatment of human tissues that is performed by laboratories around the world, allowing us to perform advanced genetic tests on specimens from even the most basic of laboratories from surrounding countries, at fairly low cost," A/Prof Chang says. "We have begun to extend these research test panels to our regional collaborators, who have expressed much interest." 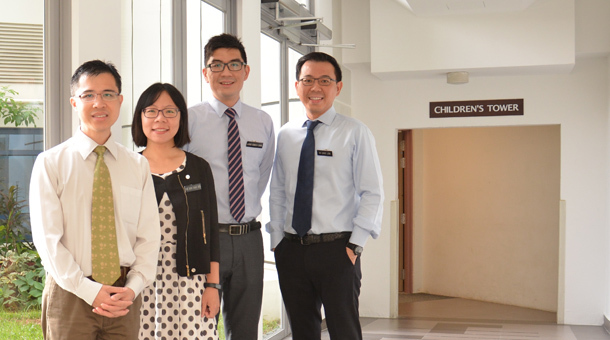 The team has established a dedicated research laboratory space in the SingHealth Academia building to cultivate cell line and animal models of solid tumours from paediatric patients at KKH. "If we are able to validate the test panel, it can be used as a full clinical test in the near future, and even form the basis of a new and better brain tumour treatment protocol," A/Prof Chang adds. Also underway are multiple projects analysing the molecular signature of paediatric solid tumours. A key study, led by Dr Chen Zhixiong, Principal Investigator, Department of Physiology, National University of Singapore, seeks to understand the prevalence and function of genes involved in cell death mechanisms, and their role in the development of neuroblastomas – a tumour of the sympathetic nerves that occurs in infants. Research into rare diseases requires the joint participation and combined experiences of healthcare centres around the world in order to supply sufficient data to power the clinical studies needed to answer critical research questions. Turning their attention to population-based science, the team has formed a strategic partnership with the Singapore Childhood Cancer Registry (SCCR), enabling them to participate in major cooperative group trials around the world. 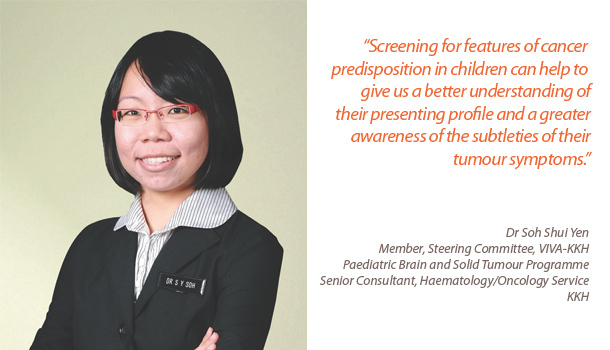 "SCCR's comprehensive database has captured more than 3,000 childhood cancer cases diagnosed and treated in Singapore since 1997, of which 60 percent are patients with brain and solid tumours," says SCCR's founding director, Associate Professor Tan Ah Moy, who is also Senior Consultant, Haematology/Oncology Service, KKH. "By making epidemiological, clinical and prognostic data on childhood cancers in Singapore available to researchers, we can drive epidemiological and outcome studies to help tailor treatment for childhood cancer patients in the future. Research findings will translate into better and more specific drug treatment, minimising side effects and improving survival outcomes at the same time." "Every patient is unique, and this is even more apparent in the field of rare diseases," Dr Loh says. "At times, no more than two or three cases of a particular tumour type may have ever been encountered in the world. To progress, it is vital for healthcare professionals to be able to connect with each other through collaborative networks, to pool insights and build on each other's discoveries." VIVA has established a platform that links Singapore with other developed nations in the Asia-Pacific region through the VIVAAsia working groups. These bring institutions together with the common goal of pursuing clinical and translational research that is relevant to the needs of children with cancer in the Asia-Pacific region. "Collaborating with international centres of excellence allows researchers and clinicians to tap into the expertise of world experts in the field. 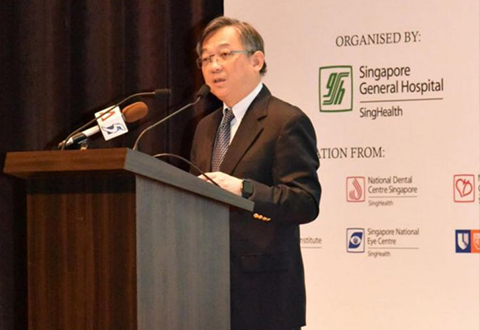 This enhances the standards of clinical care and refines research goals," Dr Loh says. 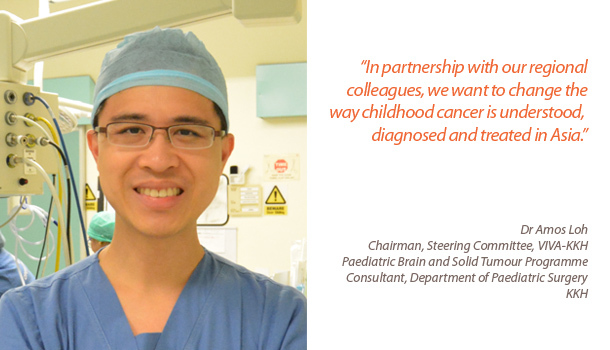 "KKH cares for the majority of children with brain and solid tumours in Singapore. Leveraging on St Jude's knowledge and expertise, and with VIVA's support, we are able to do far more working in concert to combat the scourge of childhood cancer." 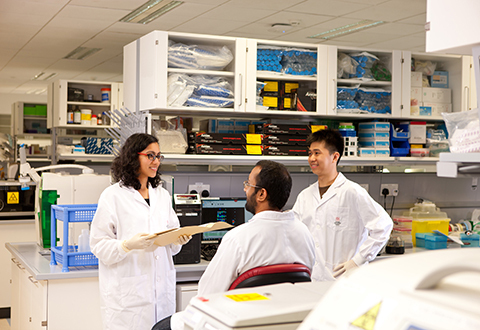 The team's ultimate goal is to see their research findings translate into changes and adaptations in treatment methods that will improve therapeutic outcomes for children with brain and solid tumours. "Up till now, we have had limited perspective into the unique biology and behaviour of Asian children with brain and solid tumours," Dr Loh says. "I believe the clinical and scientific findings from research into our patients will shed light on aspects of their epidemiology, biology, clinical behaviour, and treatment response that are new and unique to the Asian populations. In partnership with our regional colleagues, we want to change the way childhood cancer is understood, diagnosed and treated in Asia." The team hopes that the data being gathered today will in the future complement existing knowledge held by other cooperative study groups to provide a more accurate, global picture of childhood disease. "Children are our future. 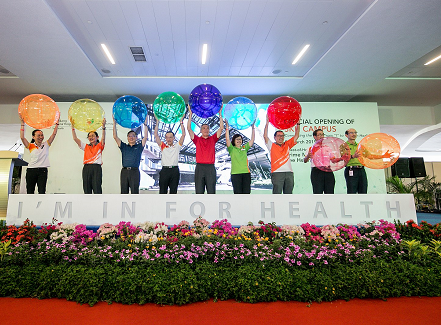 By unravelling the mysteries of paediatric brain and solid tumours in various ethnic groups, we are well-positioned to improve the future of healthcare and life expectancies for whole populations," Dr Loh notes. "This is the vision that we share as collaborators, and are working towards." This article was first published in KKH Special Delivery Issue 4, Vol 65.